Conditions of the skin are as varied as the human beings who have them. The condition of your skin is created from a variety of factors, including age, ethnicity, environmental factors including sun exposure level, diet, personal habits, and your family tree (that is, heredity). The information contained here is intended to serve only as an overview of general skin care concerns and should not replace the advice of a skin care professional, or dermatologist. What are the some of the most common skin care concerns? Acne – This is the most common skin condition that affects human beings. While it mostly affects teenagers who are undergoing hormonal changes, many adults suffer with acne as well. Acne ranges in severity, requiring topical treatment in some individuals and systemic treatment in others. The condition can cause scarring as well. If you have mild or moderate acne, you may be able to treat it with cleansers, soaps, or astringents that are widely available over the counter. You can also use alpha hydroxy acids or benzoyl peroxide. If you have a more severe case of acne, you may require systemic treatment, which includes the administration of oral antibiotics or perhaps even hormonal therapies. Your personal treatment will depend upon the cause of your acne, which can include bacteria, genetics, hormones, clogged pores or a combination of those factors. Age spots or freckles – Age spots (lentigines) and freckles (ephelides) are commonly caused from sun exposure. Both are also otherwise known as "pigmented spots." Age spots can occur in all skin types, typically arising later in life; freckles usually occur in people with fair skin. There are several ways to treat each, including hydroquinone and Retin A. However, hydroquinone is not suitable treatment for persons with darker skin. If you have darker skin, you should plan to use a treatment that contains Kojic acid. Aging skin— It’s the harsh truth: No matter who you are or what your ethnicity may be, your skin will require different care as the years go by. Chances are that as you age, you will experience increased dryness, changes in facial contour, changes in hair growth, and decreased sweating. These are the impacts of the aging process. However, several treatments have proven effective for warding off Father Time. These include: Alpha hydroxy acids, Vitamin A, copper peptide, alpha lipoic acids, L-ascorbic acids (Vitamin C). Dark skin – If you are African American, Native American, Asian, Hispanic or Southern European, you may want to avoid certain treatments. Those with sensitive skin should be especially cautious: If you use products with alpha hydroxy acids (AHAs), hydroquinones or tretinoin, you do risk hyperpigmentation (chemical reactions can cause the creation of extra pigment, which may result in darker spots). You can, however, safely use one AHA, a less irritating substance known as mandelic acid. If you are seeking smoother, firmer skin, you can also benefit from copper peptide, which is safe for all skin types. Eczema –This itchy, irritating skin condition comes in many forms and can be triggered by a variety of factors, including allergies, environmental factors, or family history. The raised, inflamed skin can appear anywhere on your body, including your face, legs, arms or neck. It can be treated with coal tar, steroid creams, topical immunomodulators (TIMs), a class of anti-inflammatory drugs that are non-steroidal. For worse cases of eczema, you may require oral antibiotics, antihistamines or oral corticosteroids. As with other skin conditions, be sure to receive a proper diagnosis from a dermatologist for proper treatment guidelines. Melasma – There are a number of treatments for this discoloration condition, also known as chloasma, which causes brown or tan patches on the face, neck or lips. The condition is aggravated by sun exposure, but does not cause redness or swelling. If you think you have melasma, but you haven’t visited a physician or dermatologist, it is important to receive an official diagnosis before beginning any treatment. This condition is most common among women who are on birth control pills, pregnant, or taking hormone replacement therapy, but men also get melasma. This condition is commonly treated with hydroquinone, kojic acid, azelaic acid, L-ascorbic acids (Vitamin C), or mandelic acid. To ensure effective treatment, you should use a sunscreen at all times. 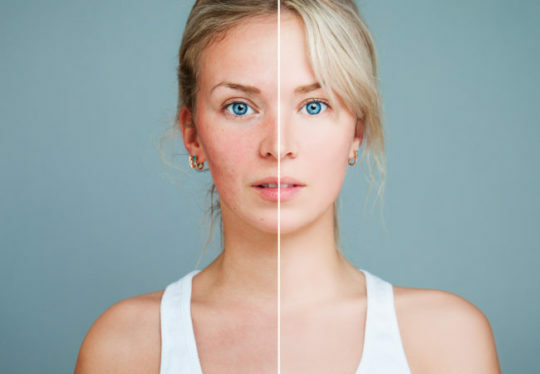 Rosacea – This skin disease causes an array of symptoms, including redness and puffiness on several areas of the face, including cheeks and nose; in later stages, rosacea will cause small, visible blood vessels on the face, bumps or pimples on the face. Before seeking treatment, you should be officially diagnosed with this chronic condition, for which there is no cure, but there are available treatments. Rosacea can be treated with topical metronidazole, retinoids, azelaic acid, salicylic acid, mandelic acid or Vitamin C. Oral antibiotics may be effective in more severe cases. It’s important to realize that rosacea is a condition that can worsen if treatment is ignored or delayed. You should consult with your dermatologist to determine what treatment will work best for you.